Submitted by via Hayle Town ... on Mon, 25/06/2018 - 12:25. 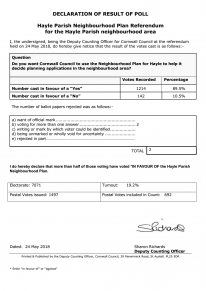 UPDATE: The Hayle Neighbourhood Plan has been adopted by Cornwall Council, effective from 20 June 2018. 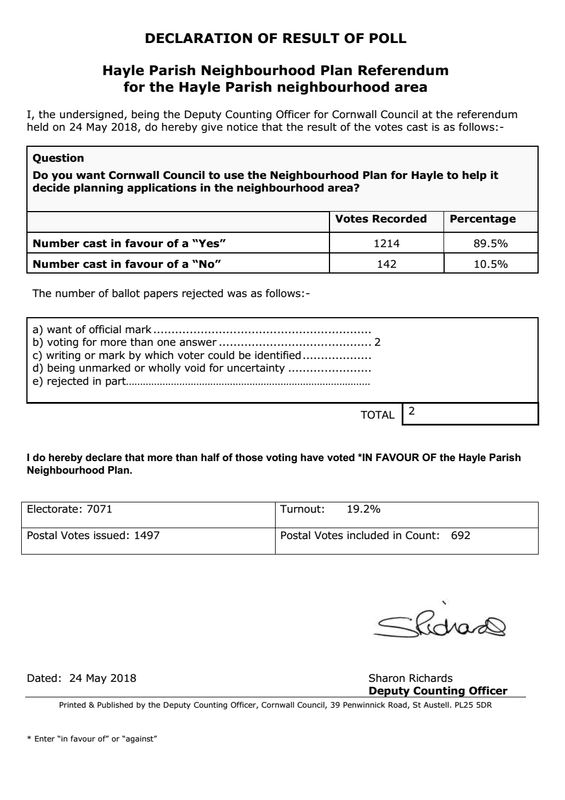 The referendum for the Hayle Neighbourhood Plan took place on 24 May 2018 and 89.4% of those who voted, voted YES. The plan will now be passed to Cornwall Council for adoption. There were 1358 votes cast out of an electorate of 7,071 for a turnout of 19.2%. For the official Declaration of Result of Poll please click here. A copy of the final Hayle Neighbourhood Plan can be seen and downloaded here.